I won't beat around the bush. 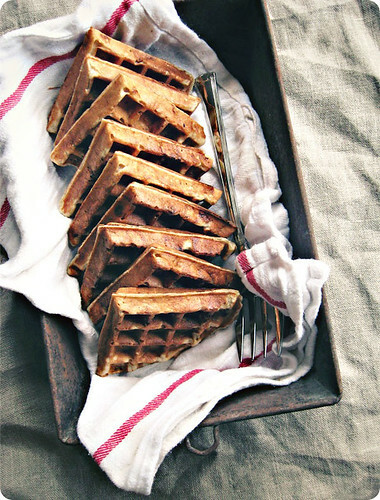 Banana Bread Waffles. Think about that for a minute, say the words slowly and out loud so that you get the full effect. 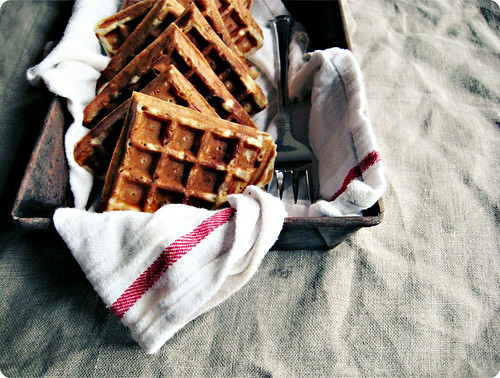 Banana Bread Waffles. I know. What could be better, right? Here's the story. Tuesday morning was damp and dark, and there were some bananas laying about, past their prime and looking woebegone. Upon the sight of them my mind went to banana bread, as I am nothing if not a creature of habit. My reaction was hardly original. A dreary sort of day pretty well begs for the heartening presence of banana bread. It is the goose down duvet of baked goods; it swaddles everything in layers of protection, like heirloom Christmas ornaments you find in your Grandmother's attic. The morning feels treasured, as do you. I forget why I didn't make the banana bread, although I was possibly influenced by our full cookie jar and the bowl of Halloween candy residing on the countertop, but either way, come evening the bananas were still around, and still despondent. Waffles came into my consideration then, with the curious notion of substituting bananas into one of the many pumpkin versions appearing temptingly on my screen for the last while. Even though I am a rookie when it comes to waffle-makery, this being the second batch of my career, I think we might be on to something here. In introducing you to these waffles, let me start with something important - they are not all that sweet. Leavened with yeast and rested overnight, they have the slight sourness typical of similarly-raised baked goods. To compound that trait, thick spoonfuls of sour cream were added to the batter and underscores that tang, bringing along with the smooth freshness of dairy. I left the job of sweetness to the maple syrup, warm and waiting, on the table. We were met with a waffle that was crisp on the outside, slightly tortoiseshell in its look, with a thick and soft interior. Rousingly spicy and fragrant with fruit, they had the best qualities of the crusty end piece off of a loaf of banana bread, my favourite part and the bit we fight over most often. Now look at that, I've gone and kept you far too long when there are waffles to be made. So sorry. I'll leave you to it. With inspiration from a variety of sources, including Dorie Greenspan (via Williams-Sonoma), and these Overnight waffles (from Better Homes and Gardens). With most of the preparation done the night before, the morning of only requires a few stirs of a spoon and you're ready to go. It's not a bad way to wake up. In a small bowl, whisk together the butter, milk and vanilla. Set aside, the mixture should be warm but not hot. In a large mixing bowl, sift or whisk together the flour, brown sugar, yeast, salt and spices. Pour the wet ingredients into the dry, whisking until smooth. Stir in the beaten eggs. Cover the bowl loosely with clingfilm and refrigerate for at least 12 hours, but up to 24. About 30 minutes before you want to make waffles, take the batter out of the refrigerator to come up to room temperature slightly. It should be doubled in size and the surface will be covered in bubbles. When ready to begin, stir the sour cream into the mashed bananas and then mix the fruit into the batter. It will deflate, but use a light, quick hand to thoroughly combine. Heat your waffle iron and bake the waffles as per the manufacturer's instruction. Our waffle maker is Belgian style and yielded 5 round waffles; I think a classic round iron would make 6 or 7. • Leftovers can be frozen and then reheated in a toaster or in an oven; keep the heat low and an eye on them though, they brown quickly.